The Division of Coastal Management awards about $1 million a year in matching grants to local governments for projects to improve pedestrian access to the state's beaches and waterways. Funding for the Public Beach and Coastal Waterfront Access Program comes from the N.C. Parks and Recreation Trust Fund. Local governments may use access grants to construct low-cost public access facilities, including parking areas, restrooms, dune crossovers and piers. Projects range in size from small, local access areas to regional access sites with amenities such as large parking lots, bathrooms and picnic shelters. Towns and counties also may use the grants to replace aging access facilities. In addition, local governments can use the funds to help acquire land for access sites or to revitalize urban waterfronts. 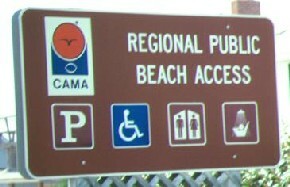 The N.C. General Assembly established the Public Beach and Coastal Waterfront Access Program in 1981 by amending CAMA to provide the matching grants to local governments for oceanfront beach access areas. In 1983, the legislature expanded the program to include estuarine beaches and waterways. As the coastal population has increased, traditional accessways have been developed for private use, leading to a greater demand for additional public access sites. While most of the early projects were located along the oceanfront, more and more are now designed to improve access to estuarine shorelines, coastal rivers and urban waterfronts. More than 440 access sites have been constructed since the program began. Local governments are responsible for construction, operation and long-term maintenance of their sites. Looking for a CAMA access site? Look for the blue and orange sign. For more information about access site locations visit our interactive webmap at coastalaccess.nc.gov. For information about public access grants in your community, contact the Division of Coastal Management. North Carolina's beach and waterfront access sites are categorized into four groups: Regional, Neighborhood, Local, and Waterfront. Regional access sites are generally the largest and often feature restrooms, showers, picnic tables, and ample parking (25+). Neighborhood access sites generally have fewer parking spaces than regional sites and often do not have facilities such as showers or restrooms. However, there are exceptions. Local sites are often simply dune crossovers with little or no associated parking and no facilities. However, bicycle racks may be provided. These are primarily used by pedestrians who reside within a few hundred yards of the site. Waterfront sites are generally located on estuarine waters in urbanized areas. They vary greatly in the amount of parking and facilities provided.